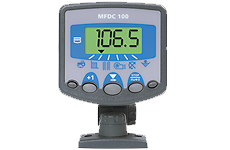 The MFDC 100 is a user-friendly and cost-effective method of monitoring a number of seed drill operating functions and controlling the tramline sequence. Controls tramline function of seed drill. Helps monitor machine performance for increased efficiency. Symmetric and asymmetric Tramline count. Shaft speed and fan speed metering.